We at The Weller Legal Group know how difficult it is to file bankruptcy. We are here to help you with making the Chapter 7 bankruptcy process easier for you and your family. In this article we are going to discuss a common question that we get asked and that is what are the duties of a Chapter 7 bankruptcy trustee. Chapter 7 bankruptcy is the type of bankruptcy where a trustee is appointed to liquidate nonexempt assets to pay off creditors. After the proceeds are exhausted, whatever remaining debts will be discharged. In order to file for Chapter 7 bankruptcy, the debtor must not have a preceding case of Chapter 7 bankruptcy within the last 8 years. Chapter 7 bankruptcy is also known as a straight or liquidation bankruptcy. The Chapter 7 bankruptcy trustee must review the debtor’s petition. The trustee will review your personal and financial information about your debts to verify that they are accurate. If the bankruptcy trustee discovers any fraud or abuse to the bankruptcy system they will be obligated to report it. You will most likely have to send the Chapter 7 bankruptcy trustee your paystubs, tax returns, and any other information regarding your assets. The trustee will be responsible to examine the debtor at the hearing to decide whether or not you are being honest with your situation. Usually the creditors will not attend these hearings, so it is in the creditor’s best interest if the trustee can determine if the information you give them is accurate. If the trustee believes that you are withholding information, they may press you by asking you more questions while you are under oath in the court room. The trustee will be responsible for selling your assets after they determine the value of your nonexempt property. During your bankruptcy case there will be exempt assets and nonexempt assets. The exempt assets are property that you are allowed to keep even after filing Chapter 7 bankruptcy. The nonexempt assets are property that your creditors will liquidate in order to retrieve as much money back as they can. In regards to the selling of your assets, most likely the Chapter 7 bankruptcy trustee will hire an auction company and they will auction off your assets to the highest bidder. Your Chapter 7 bankruptcy trustee will appear at your creditors meeting. This meeting you must also attend or your bankruptcy case can be dismissed. During this meeting they will try to determine what assets are exempt and which are nonexempt. Usually the trustee will come alone but in some cases they may be accompanied by an attorney. Many people are unaware of this but a Chapter 7 bankruptcy trustee may ask to search your home to determine whether or not you are hiding nonexempt property. If you decide not to cooperate with the trustee’s request to search your home they can obtain an order from the court to search your property. If the trustee discovers any additional nonexempt assets they will have to report these additional items to your creditors. Sometimes during your Chapter 7 bankruptcy case the trustee will abandon some of your property. Even if the property is a nonexempt asset the trustee may determine that the property is not worth selling for whatever reason. Some reasons may be that the items may cost more to sell than they are worth or will be difficult to liquidate. For example used furniture may be a situation of a nonexempt asset that the Chapter 7 bankruptcy trustee won’t bother with selling. In the case of the trustee abandoning the item you will be able to keep your item and not be forced to sell it. The Chapter 7 bankruptcy trustee must be able to review if there was any special treatment for certain creditors. For example, if the debtor paid back a certain creditor like a family member before filing bankruptcy then the trustee may be able to undo these payments or get property back to distribute the funds to all of the creditors. If the debtor is behind in child support payments the trustee must be able to provide notices to the holder of the child support claim and the child support agency to keep them updated on the status of your bankruptcy case. The trustee may have to provide them with some of the following information, your last known home address, your employer’s name and address, and the name of any creditor who holds a non-dischargeable claim against you. The creditors can also release this information in regards to your last known address to both the payee and child support agencies without penalty from the law. The Chapter 7 bankruptcy trustee must be accountable for all of the property received from the debtor. They must ensure that the debtor performs their intention on surrendering property to help pay back debt to creditors. The Chapter 7 bankruptcy trustee must be willing to thoroughly investigate the financials of the debtor. HOW DO CHAPTER 7 BANKRUPTCY TRUSTEES GET PAID? The Chapter 7 bankruptcy trustee is paid a commission by the court based on your property that they sell to pay back your creditors. This is one of the reasons why the Chapter 7 bankruptcy trustee will be very careful in accurately determining the value of your nonexempt assets. The commission that the trustee may receive may be anywhere from 5% to 25% of your sold assets depending on the amount. 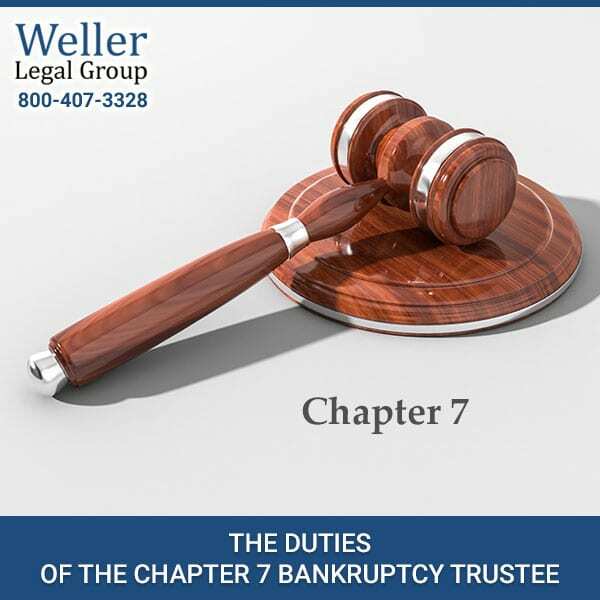 We at The Weller Legal Group hope that the information provided in this article helped you understand the duties of the Chapter 7 bankruptcy trustee. We primarily practice bankruptcy law and represent only debtors. We have offices located throughout Florida, including, Clearwater, Port Richey, and Lakeland. If you have any other questions in regards to bankruptcy feel free to give us a call today at 1-800-407-3328.